Top stuff. Bookmarked this page after stumbling upon the Laka Trail while sniffing about in the trails above Wulai. Thanks for the hard work documenting these walks, I’ll try them out when I move here next year. I hiked the route to the Yunei trees from XiaoWulai via White Veil Falls on two seperate occasions this summer. For those planning to do this route (in the opposite direction to the itinerary in the book), there are a few things worth noting. The trail head begins after finding the dirt road turnoff to a farm near telephone pole #52 on the kapu Road. Coming up from XiaoWulai, it’s about 5 kms in. Go down the dirt road and past the farm buildings and look for tags hanging from the start of the bamboo forest on the left. After about a kilometer there is a trail split just before a stream junction.The left path goes up to the waterfall part of the stream, but a landslide has destroyed the trail on the other side. Take the right side path and cross the same stream a little lower down. Don’t cross the further stream. The landslide from recent typhoons destroyed the route at this point, but by scrambling up and into the forest the tagged path can be rejoined and the rest of the route to White Veil Falls and the YuNei trees is in ok condition. In full spate, White Veil Falls is one of the most impressive waterfalls in Taiwan. Thanks again Lyndon! Planning to do the waterfalls as part of a weekend camping trip this fall, climbing Mt Beichatian as well, so good to know the path is (more or less) still walkable! 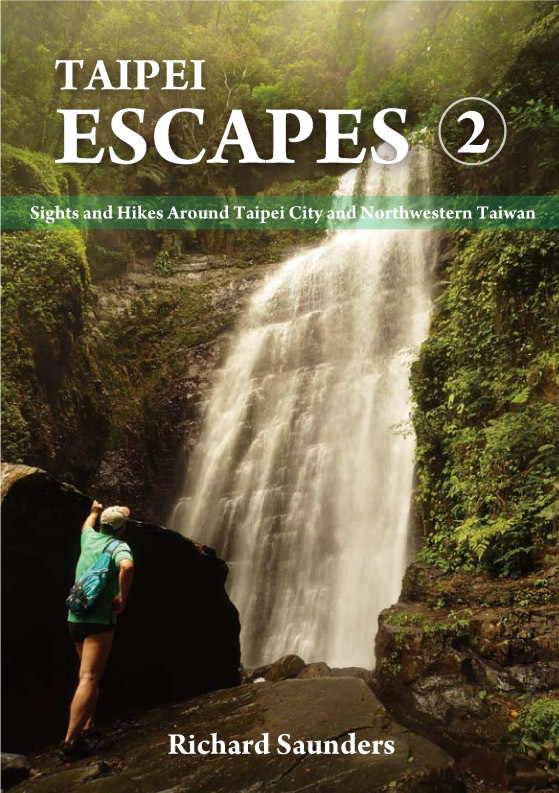 I just bought your book Taipei escapes 2, can’t wait to get started. I have now officially completed all 40 hikes or “walks” from both books. Do I get a free T-shirt or something? Ha. Wow! Congratulations! You might just be the first person (other than me!) to have done them all! Yesterday we connected Nanshijiao to Tucheng – walk 33 from Escape 2. The hike was pretty amazing, and it took us 5 hours to completed it. We got one surprise at the step 13 where you have to take a right dirt trail before the concrete water tank. The ropes are still there, but the path haven’t been used since a while and the jungle as overgrown the trail: Branches, dead trees, bambou need to be put away to pass. We struggle for about 30 minutes, longing the green fence. We then fall on a real trail. We think it’s another alternative, but we will have to confirm it in a next attempt. About 200 meters before the trail abruptly ends (step 13), on the right side, it’s a clear dirt trail. Some plastic trail marker are attached to the trees. Another alternative could be, once arrived at the end of the trail in the residential area, turn right till a new trail appears (TBC). If someone have done this trail no so long ago, we are open to suggestions to avoid this abandoned area. Hey thanks Tim! Last did this trail a few years ago (I prefer the western part of the trail – the Tucheng-Sanxia hike in the book), but looks like it’s changed a bit since then. Thanks a lot for writing your notes down here! Hope to do it again some time myself.